Yeolmu mul kimchi is usually eaten in summer in Korea. Making bibimbap with barley rice, doenjang jjigae, yeolmu kimchi, hot pepper paste and sesame oil is one of the most popular and delicious dinners for hot summer. My mouth is watering while writing this explanation! 4 pounds of yeolmu (young summer radish), salt, flour, fish sauce, sugar, garlic, ginger, onion, green chili pepper, red chili pepper, and water. Peel the radishes and remove any dead leaves. Cut into pieces about 5 cm long and put them into a big bowl. Soak in cold water and drain. Add ½ cup of salt and mix with your hands. Let it sit for 30 minutes. 30 minutes later, turn it over to salt evenly and let it sit another 30 minutes (total salting takes 1 hour). Rinse and drain the salted yeolmu thoroughly until all the grit and dirt are removed. Drain in a colander and set aside. In a small pot, mix 1 tbs flour and 1 cup of water and heat it over medium heat until cooked. Occasionally stir the mixture until the liquid thickens. Slice 1 cup’s worth onion thinly, mince ½ tbs of ginger, chop 2-3 red chili peppers, 2-3 green chili peppers, mince 4 cloves of garlic, and put them into a large bowl. Add 2 tbs of hot pepper flakes, the porridge, and ¼ cup of fish sauce. Mix well. Add the yeolmu and mix by hand. Transfer to a container or glass jar. Mix 8 cups of purified water and 2-3 tbs salt in a bowl. Pour into the jar of yelomu kimchi and mix well. You can eat it right away, but if you prefer it fermented keep the jar at room temperature for a couple of days. Normally, it should be stored in the refrigerator. Posted on Saturday, May 17th, 2008 at 8:34 am. Last updated on October 5, 2014. Posted July 19th, 2016 at 8:05 pm | Log in to reply. Maangchi, I made this recipe the other day and although I love it m, the rest of my family doesn’t. 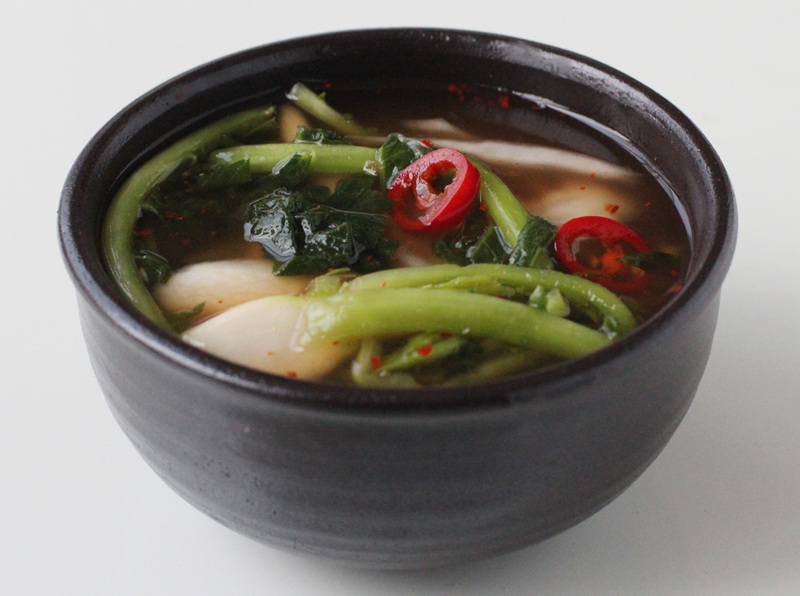 If I take the young radish out of the broth, can I cook with it instead like I do kimchi? Do I add any other sauces to it like red pepper paste or powder?? Posted July 20th, 2016 at 5:02 am | Log in to reply. I’d chop it thoroughly (preferably in a food processor) and smuggle it into fillings, pancakes etc. ; use it as you would any other kimchi. Keep it in the liquid until you use it; the liquid can be diluted as a beverage and for naengmyeon. Posted December 8th, 2015 at 11:46 am | Log in to reply. Posted October 29th, 2015 at 12:20 am | Log in to reply. 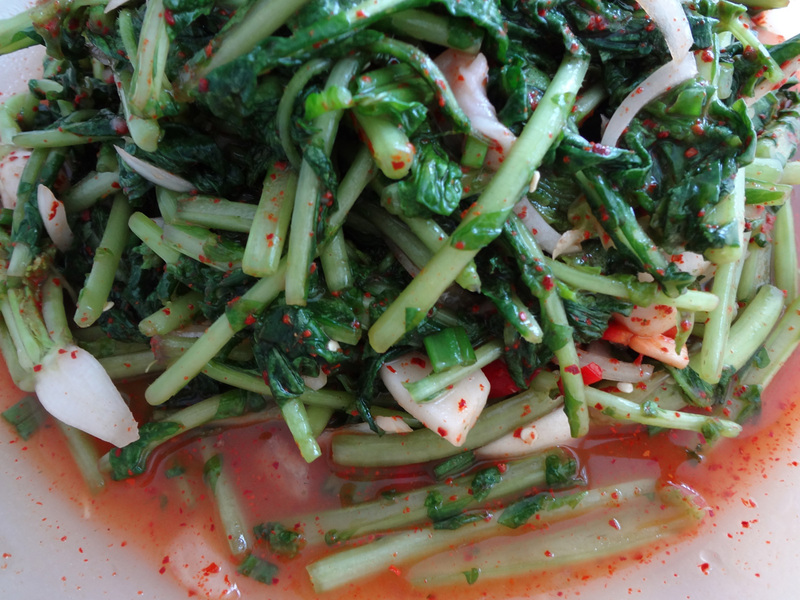 Yes, yeolmu is a summer vegetable, so Koreans make it in the summer time. 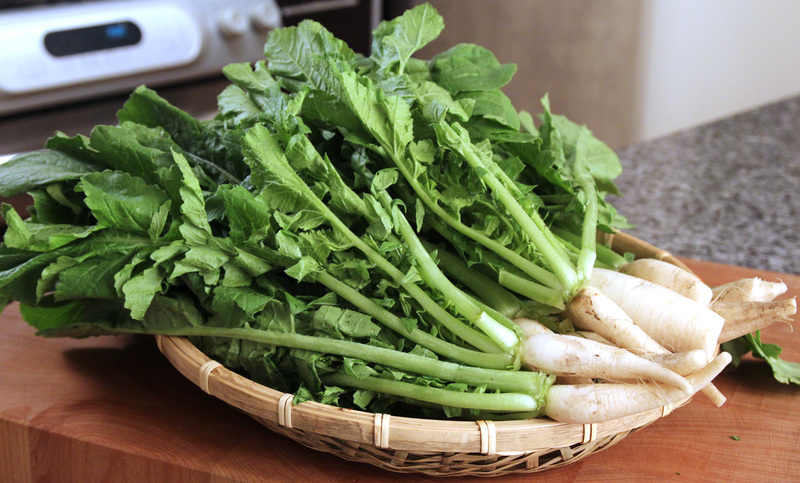 Do some experiments with other vegetables such as bok choy, radish, small red radish. Good luck with your kimchi making! Posted October 28th, 2015 at 7:23 pm | Log in to reply. I was wondering is this kimchi only made in summer ?? we cannot find any yeolmu in winter is that it? because i wanted to make yeolmu mulkimchi and Chonggakmu kimchi but i’m under the impression does vegetables are only available in summer or so am i righ? Posted October 20th, 2015 at 4:13 pm | Log in to reply. Maangchi… i made this but forgot to add salt to the water! i did add fish sauce….. will it still be good to eat after 2 days fermenting without salt? i salted the yeolmu in the initial step, but washed t up…. Posted October 20th, 2015 at 4:34 pm | Log in to reply. Taste the kimchi brine and if it needs salt, you can add it now. Take some brine, put it in a bowl, add salt, and stir well. Then add to the kimchi. Good luck! Posted June 1st, 2015 at 1:04 pm | Log in to reply. I actually found some yeolmu last week at a local korean market. I made all 2.5kg of them into kimchi. I got 2 a liter jars full of yummy yeolmu mulkimchi. I was making baek kimchi so i add the remainder of the brine i made for dongchimi and baek kimchi into them. Since it’s quite hot out here in Indonesia, they ferment quickly. I only left them out for the whole day and they were ready to go into the fridge. I made doenjang jigae today and since it’s so hot i decided to make bibimbap like you suggested in this recipe. OMG, the yeolmu kimchi combine with the vegetables in the doenjang jigae plus gochujang and sesame oil is super tasty. I also added some dubu jangaji for protein. It was amazing. I think I’ll make more tomorrow. My son doesn’t usually like to eat rice but this bibimbap he gobbled up like he hasn’t eaten anything for 2 days. We finished the rice i made for the day at lunch. I ended up making naengmyeon for dinner. Thank you so much for sharing the recipes. Korean food is really good to eat at all season. I can eat a lot without worrying about gaining weight. When I gained weight from eating too much rich Indonesian food, i lay them off and eat rice with kimchi, doenjang jigae or guk, always keep dubu jangaji in my fridge. After just 1 week of rice or noodle with korean food and kimchi, i lost most of the weight i gained. So hansik become my weight loss food. Tasty and healthy, what more can I ask for? Posted July 21st, 2014 at 11:06 am | Log in to reply. I wanted to express my appreciation for sharing all of your recipes, Young summer radish water kimchi is one of my husband’s favorite summer dish. Keep up the good work! Posted July 21st, 2014 at 9:34 pm | Log in to reply. Posted April 18th, 2014 at 5:42 am | Log in to reply. Hi Maangchi, I love watching your videos and enjoy making your recipes. Before the summer comes, I want to store the young radish kimchi in the fridge. However, I don’t know how long I can keep it in the fridge. Can you tell me(@[email protected]? Posted July 14th, 2014 at 12:23 pm | Log in to reply. You can eat it until it runs out just like other types of kimchi but it will get sourer as time passes. I usually finish eating yeolmu kimchi in 2 weeks. Posted March 8th, 2014 at 11:57 pm | Log in to reply. Last time I thought that I found some yeolmu but it wasn’t yeolmu after all. It was young daikon radish with the leaves in tact. 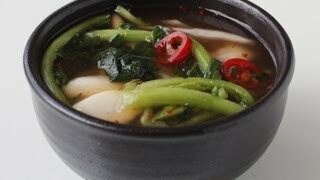 I used it to make this recipe and I found it tasty but the leaves too tough to eat hence I use the leave in my doenjang jigae. Could I actually use those young daikon in place of yeolmu? Would it affect the taste considering korean radish is sweeter than daikon? Also when I first made this recipe with the young daikon, the juices was a bit cloudy. I used sweet rice flour porridge as I was out of regular flour at the time. Was the sweet rice flour the cause for the cloudiness of the juices? Posted July 14th, 2014 at 12:26 pm | Log in to reply. Yes, you can make kimchi with radish top but the kimchi should be made when they are tender. “the leaves too tough to eat hence I use the leave in my doenjang jigae” yes, you did a good job. Posted June 24th, 2013 at 1:10 am | Log in to reply. hi maangchi, i love watching your video. thanks for being there hmm. i just wanna know if it is good to substitute the 열무 to 단배추? Posted June 24th, 2013 at 1:21 pm | Log in to reply. yes, you can use the cabbage instead of yeolmu. Posted January 11th, 2013 at 7:58 pm | Log in to reply. This looks beautiful…another thing to grow this summer! Posted April 28th, 2012 at 9:22 am | Log in to reply. I really love naemyeon, especially in the summer when it’s very hot. It now is at where I live. I used to eat these cold noodles when I was still in the states. Here, I no longer have a chance to and it’s such a pity. I now crave this delight, but I actually don’t live near any korean market; so that’s a bad thing. I had this idea of making my own yeolmu kimchi but I can’t seem to find any yeolmu in my area. What can I use in place of yeolmu, Maangchi? Please help me out a.s.a.p. Posted April 30th, 2012 at 12:05 pm | Log in to reply. How about using Chinese broccoli or mustard greens? You can add some daikon, too. Posted April 27th, 2012 at 12:44 pm | Log in to reply. I love your cooking and all but I have a slight problem. I’m interested in making your yeolmu kimchi but I can seem to find yeolmu at my area. What can I replace it with in order to make that delicious vegetable, Please help me out a.s.a.p. Peace out! Posted April 27th, 2012 at 6:55 pm | Log in to reply. I think must greens will work well with this recipe. Posted June 8th, 2011 at 12:21 pm | Log in to reply. I was just curious if there was a specific reason for using a stainless steel bowl or could I use glass or plastic? Posted June 8th, 2011 at 5:52 pm | Log in to reply. yes, you can use glass or plastic bowl, too. 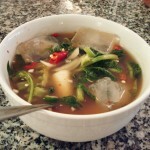 This recipe was originally posted on May 17, 2008 at 8:34 am by Maangchi. It was last updated on October 5, 2014. The video was watched 150,662 times on YouTube & has 664 likes!